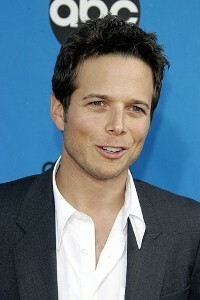 His son Jackson is just 7 months old, but actor Scott Wolf says with a strong name like "Jack" he’s destined to do big things. "I think hes either going to have to write something or he’s going to really enjoy bourbon and have a regular chair at a pub somewhere," Wolf said on a recent appearance on the Billy Bush radio show. The first-time father says being a parent has been an amazing experience thus far – one he admits he has a hard time explaining. "I can not put into words how great a person he is. He literally wakes up with a smile on his face and falls off to sleep with a smile on his face," he said. While admitting that Jack does shed the occasional tear, Wolf says he’s already figured out that acting silly can put an end to the crying. "The kid seems to really love to be alive and he makes me feel like the funniest person on the planet," he said. Wolf is best known for his role on Fox’s 1990s hit Party of Five. He currently be seen in the remake of V, the alien-inspired miniseries that recently debuted on ABC. He’s married to former reality TV star Kelley Limp. Jackson is the couple’s first child.